Thanks Marcy. You are one of the actual incredibles. Desperate times call for desperate measures…Devin is desperate…Not a good state of mind to be in while trying to defend a corrupt and treasonous administration which he helped as a member of the transition team. The good news is that Mueller has the information on Nunes’ treachery and his cohorts’ actions and is likely building a substantial obstruction case now. Now this would have been in May of 2016. Which is obviously months before this counterintelligence investigation was opened by the FBI into the Trump campaign. Carter Page has been under investigation, if not continuously, at least intermittently, since 2013. I had to look up Walid Phares. He’s a doozy. It’s unbelievable that Trump could pay such a blatant Islamophobe in his campaign and that the Supreme Court decided to be blind to that (to wit, Flynn, Prince, Bannon, Bolton, Dershowitz, et al) along with their anti-people, pro-corporation Kochy tunnel vision, in general. Also, LMAO at “Half-Wit”. Henceforth, that’s how he should be referred to; it’s the perfect gangland nickname, like “Mickey Medallions” was for Cohen. 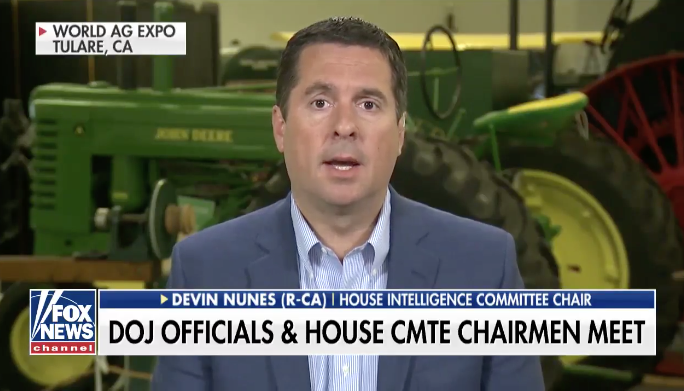 I’ve nicked him Devin “noony-noony” Nunes after the typewriter on Sesame St.
has always tickled me, and works well with any part of his given name or without. I’d say Devin is a Quarter Wit at best. Why isn’t Devin Nunes or Rohrabacher on this list again? According to a Friday report by TIME magazine, the U.S. Navy may be planning to detain tens of thousands of immigrants (accused of illegally entering the country) in Concord, despite the fact that the Environmental Protection Agency [EPA] still lists the Concord Naval Weapons Station as a Superfund site, a designation reserved for some of the most toxic places in the country. I’m not barron and also piss off TROLL. Big apologies, was making a joke! I was pretending to be tRump’s publicist and stating the reality of the threat in godfather vernacular. Been coming here since live-blogging was born. Sorry JohnJ. I wasn’t familiar with you, and thought it was a drive-by Troll shoot. I’ve been especially pissed off since the retirement announcement. Yeah JohnJ has been around basically forever. He is no troll, and I wish he would comment more. Yeah, I felt bad about it and apologized. But this site has had a recent increase in drive-by trolls (along with the consistent ones), so my mistake can be understood. I can’t wait to have D. Nunes entire roll exposed in public. Is he just a gimp who dreams of being the next S. Hannity? do trumps people have something? the vast majority of people getting caught up in indictment do not surprise me. Devin baffles me. Funny Manafort not on list. Beyond saving? Hmmm… maybe the list is pardon requests? It does not seem likely that Nunes is anyone’s idea of a bright bulb. Neither is Strzok for that matter, but that’s another story. OTOH, remember that “Greenburg” (from prior court testimony) was a long time asset. Something like 17 years, he was making a career of it. He would have been working for counterintelligence, where Strzok was deputy, and where the old perfesser (Halper) and his “aide” who tried to set a honey trap for Popadopolous also appear to have worked. These approaches are logically consistent with Stzrok’s “insurance policy”, and we have not seen anything so far that would show they were not. Curious also that DoJ/FBI have refused to reveal to Congress if Stzrok was who filed the FISA request, if he used the Dem “Dossier” sewage to support it, or if the request went to Stzrok’s buddy a Judge on the FISA court. The Trumpies are a bunch slimeballs, but that does not mean the FBI and IC (CIA especially) were the good guys or telling the truth. The enemy of my enemy is not necessarily my friend, especially when he/she is using their USG authority and power to affect the outcome of an election. The corruption of our governmental institutions, especially police and intel, is as potentially profound for the country as the Trump presidency, and likely longer lasting. There was a recent post here discussing it. You should look it up. You know what’s longer lasting, lefty? SC appointments. That is just lazy tired old crap. The meaning of the words are plain in their context, which is now grossly distorted by malignant conspiracists. It was emphatically not about creating an insurance policy. It was in the context of discussing what might happen in general should Trump win, when one side of the discussion said (to the effect) the chances of that happening seem remote, and the other responded that though seemingly remote the scale of the chance is on par with the sort people take insurance cover for. You got that wrong too. It is “Trump is bad, AND…” That is not an excuse for Trump simply a recognition that there was official corruption opposing him, BUT perhaps you like that. You might not consider it so attractive if you found yourself on the receiving end. It is worth looking at what Mueller, as FBI director, did to Bruce Ivins in the Anthrax investigation after they falsely tried to crucify Hatfill and he fought back. Mueller publicly ruined Ivins then hounded him to suicide. The FBI has a long sordid history of not too bright and hurting people that anger it. That is not a defense of Trump. It’s consistent/persistent minimization of anything Trump. To the point of troll mimicry, if not outright trolling. You ignore the parts against your arguments, and clearly don’t read what Marcy writes. “insurance policy” may have been code for something else. Do not always interpret words litterally that come out of IC. May have been a hidden signal message. You guys are so infected with TDS you are blind. Put Strzok’s txts about insurance policies, we’ll stop Trump from becoming president, and my FISA court judge buddy in time frame context with actions like Greenburg, Haspel and and FISA warrants for example and the picture is not so sanguine. Horowitz laid out the behavior then avoided drawing conclusions, very similar to what Comey did with Hillary in his July dog and pony show. Again, the enemy of your enemy ain’t necessarily your friend, but you have to use your head for something besides a hat rack to understand that. You mention something you call TDS, which we must assume refers to Trump Derangement Syndrome, no doubt a copy of Clinton Derangement Syndrome, which started back in the early 1990s. After decades of formal investigation into the Clintons, and the spending of perhaps a hundred million dollars, no indictments were forthcoming. Because the Clintons are not law breakers. But after just a few months of investigation of the Trump campaign, dozens of indictments are extant, and several people are convicted of felonies. So who could have invented Trump Derangement Syndrome? Those of us who believe that Trump is a stooge of Putin don’t need any derangement — the evidence is clear… Trump is owned and operated by Russia. Eventually this will all be proven in a court of law, or in the legislative court of impeachment. And Russian trolls like you will be watched all the time… enjoy it.